Below is basic information on bail bond laws for Ohio concerning Bail Enforcement, Bounty Hunters, Fugitive Apprehension and Bail Bondsman. This is not legal advice. Laws change frequently, please check the links provided for possible updates and current information. Baldwin’s Ohio Revised Code Annotated West’s Ohio Rules of Court Local Rules of Practice of The Franklin County Common Pleas Court, General Division Criminal Rules of Practice And Procedure Rule 67 Bail Forfeiture. Ohio House Bill No. 730, Ohio 123rd General Assembly — 1999-00 Regular Session Introduced Version Date June 7, 2000 Code relative to the regulation of surety bail bond agents and the apprehension or arrest of a principal on bond. Ohio’s statutes currently do not regulate the licensing of bail agents nor do they explicitly give agents arrest authority, though such may be implied, however, and is also provided for by case law (see section #7). Legislation is currently pending (H730), which provides lengthy and detailed regulation of “surety bail bond agents” and also explicitly grants such arrest authority. Due to the size of this legislation, only a reference to the bill itself and a few short provisions are given below. In addition, the closest statute to licensing requirement in the current statutes is also given. § 3905.84. No person shall act in the capacity of a surety bail bond agent, or perform any of the functions, duties, or powers prescribed for surety bail bond agents under sections 3905.83 to 3905.95 of the revised code, unless that person is qualified, licensed, and appointed as provided in those sections. § 3905.85. (a) an applicant for a license as a surety bail bond agent shall submit an application for the license in a manner prescribed by the superintendent of insurance. The application shall be accompanied by a one hundred fifty dollar fee and a statement that gives the applicant’s name, age, residence, present occupation, occupation for the five years next preceding the date of the application, and such other information as the superintendent may require. The applicant shall also request a criminal records check conducted by the superintendent of the bureau of criminal identification and investigation in accordance with section 109.572 of the revised code, and direct that the bureau’s written response to that request be transmitted to the superintendent of insurance, or to the superintendent’s designee, as specified on the form prescribed pursuant to that section. If the superintendent of insurance or the superintendent’s designee fails to receive the bureau’s response to the applicant’s request for a criminal records check, the superintendent may refuse to issue a license under this section. the applicant shall pay any fee required by the bureau for conducting the criminal records check. an applicant for a license shall submit to an examination as to the qualifications set forth in division (b) of this section. (1) if the applicant is a natural person, the applicant is eighteen years of age or older. (2) the applicant is a person of high character and integrity. Every surety, except a corporate surety licensed as provided by law, shall justify by affidavit, and may be required to describe in the affidavit, the property that the surety proposes as security and the encumbrances on it, the number and amount of other bonds and undertakings for bail entered into by the surety and remaining undischarged, and all of the surety’s other liabilities. The surety shall provide other evidence of financial responsibility as the court or clerk may require. No bail bond shall be approved unless the surety or sureties appear, in the opinion of the court or clerk, to be financially responsible in at least the amount of the bond. No licensed attorney at law shall be a surety. Members of an association incorporated under GC 10200 (RC 1731.01) et seq. for the purpose of apprehending and convicting any person or persons accused of either felony or misdemeanor may make arrests anywhere within the state, subject to the limitations prescribed in GC 10203 (RC 1731.03) and GC 10204 (RC 1731.04). (Annotation from former RC 1731.03.) Fouts v. State (Ohio 1925) 113 Ohio St. 450, 149 N.E. 551, 3 Ohio Law Abs. 691, 23 Ohio Law Rep. 592. Ohio House Bill No. 730, Ohio 123rd General Assembly — 1999-00 Regular Session relative to the regulation of surety bail bond agents and the apprehension or arrest of a principal on bond. 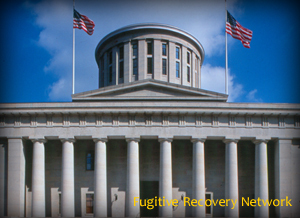 At this time, there are no specific regulations for “Bounty Hunters” in the Ohio statutes, however H730 referred to above provides provision on fugitive recovery. Please check with the Ohio’s Department of Insurance, Licensing Board and/or Local Law Enforcement for the most recent updates. If you know of any updates to Ohio’s bail bond laws, please provide as much detail as possible and send to us using our contact form.